Home to the lightest and smallest LED Loupe-Light, Ultralight Optics Inc is the FIRST modern dental company founded by a dental student, RON NGUYEN DDS, at the University of Southern California, School of Dentistry. It all started with a phrase uttered by many dentists, “Why can’t they make this better?”. While many overlook the need, Ron took it by heart. By enlisting the help of the entire USC School of Dentistry, and with many engineers, Ultralight Optics were able to greatly improve and revolutionize LED lighting technology. Invented by Dr. Ron Nguyen, Feather Light LED has gone far beyond his expectation to become the most popular choice of LED headlights for dentists in the market since its official release in 2006. Feather Light LED received rankings as the TOP choice in 2009, and 2010 as rated by an independent non-profit dental education and product testing institute. Prior to 2006, lights were a rarity in dental schools. One by one, as Dr. Ron Nguyen introduced Ultralight Optics into each school, they instantly adopted lighting technology and saw the immediate benefits. Being so young, he is now considered the grandfather of illumination in dental schools. Now, Dr. Ron Nguyen travels around the nation inspiring young entrepreneurs to develop new ideas and realize dreams. Going against the odds himself, he demonstrated that it is very possible to be small, yet tackle conglomerate companies with big advertising budgets, simply by inventing products more in tune to dentistry and his style of practice. Ultralight Optics pioneered the Loupe-Light revolution. That is why when you search “loupe light” on the internet, we are the first in the list. Prior, loupe lights were never popular because of the heaviness. We are the first to integrate optical designs and aircraft-grade aluminum alloys for the most technologically advanced headlight. Because Feather light is made by dentists, for dentists, it captures every functional aspect of illumination necessary in dentistry, ergonomics, and vision care. The success and innovation of Feather Light LED have been the inspiration for numerous articles, featured in Dental Town, Dentistry Today, Dental Economics, Dental Product Shopper, Dental Product Report and many more. Proud with what we achieve yet driven with more inspirations from a visionary leader- Dr. Ron Nguyen, Ultralight Optics is continuing its journey to design and invent more dental related products with one question in mind ‘Why can’t they make this better? Actively used across the dental industry, Feather Light LED can be found in nationwide dental schools, and offices of general practitioners and specialists. Our light has even become popular among many board members of the ADA and CDA. 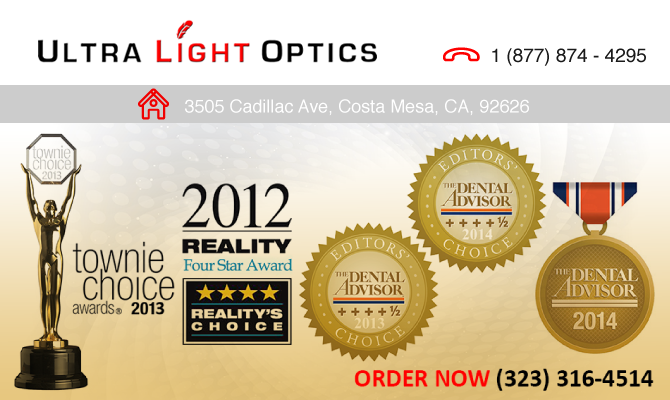 Designed by Dentists and Opthalmologists, Ultralight Optics knows exactly what we need in the dental profession. We have been the industry leader in both weight and size by far and repeatedly rated as the #1 LED headlight. Smaller than a dime (0.65″ in diameter) and lighter than a nickel (0.13oz or 4g), Feather Light LED is the LIGHTEST and SMALLEST LED loupe-light. The revolutionary optical design and use of aircraft-grade aluminum alloy allows Feather Light to be the most optically efficient. Such construction constitutes Feather Light the only technologically advanced headlight to deliver an intense beam of light while providing unsurpassed comfort. With the largest selection of customized mounting brackets, the Feather Light LED is the ONLY light that can fit all brands and models of loupes. The lithium ion battery provides 8 hours of consistent brightness on the highest setting, allowing you to work with lighting for the full working day. It can also fully charge with our quick charger in under 3 hours. *We customize attachments brackets for ALL loupes types. Call customer service at (323) 316-4514 for your attachment customization.